Please refer to our stock # SEA139 when inquiring. 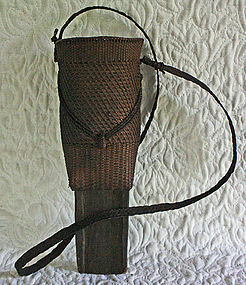 This knife sheath would be hung from the woven shoulder strap by the hill tribe hunter. This one was brought back from the border region by a friend. Now heavily patinated with use and age, it was beautifully hand made many years ago and was both light weight and serviceable. It is a wonderful artifact of an age and culture that is rapidly disappearing.